The Land and Water Boards of the Mackenzie Valley (the Boards) and the Government of the Northwest Territories (GNWT) are pleased to announce the release of the Guidelines for Aquatic Effects Monitoring Programs (the AEMP Guidelines). Please see the News Release and attached documents below for further details. The Land and Water Boards of the Mackenzie Valley have released revised Rules of Procedure. Please see the attached News Release for additional information about the changes to the Rules. Thank you to all contributors for their valuable input! Click here for direct link to the Registration Page. 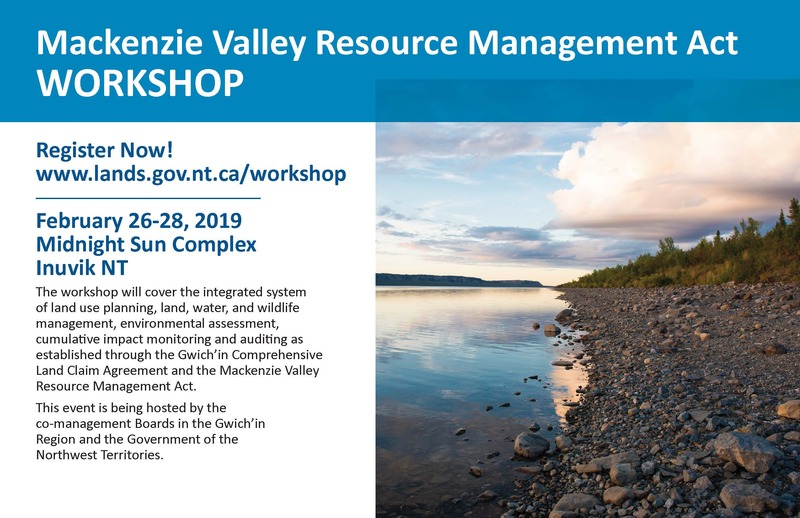 The Mackenzie Valley Land and Water Board (MVLWB) is accepting applications for a Regulatory Intern to join our Yellowknife team for a 6-month term. See full job posting on our Careers page. Applications should be submitted to the Executive Director at careers@mvlwb.com. Applications must be received by 5:00 p.m. on May 15, 2018. The Land and Water Boards of the Mackenzie Valley (Mackenzie Valley, Sahtu, Gwich’in, and Wek’eezhii) in collaboration with the Government of the Northwest Territories – Environment and Natural Resources (GNWT-ENR) and the Mackenzie Valley Environmental Impact Review Board (MVEIRB) have drafted Guidelines for Aquatic Effects Monitoring Programs. We invite reviewers to provide comments and suggestions to both improve the Guidelines as well as the current regulatory practices for AEMPs. See the Guidelines on our Online Review System, and submit your comments before February 28, 2018.